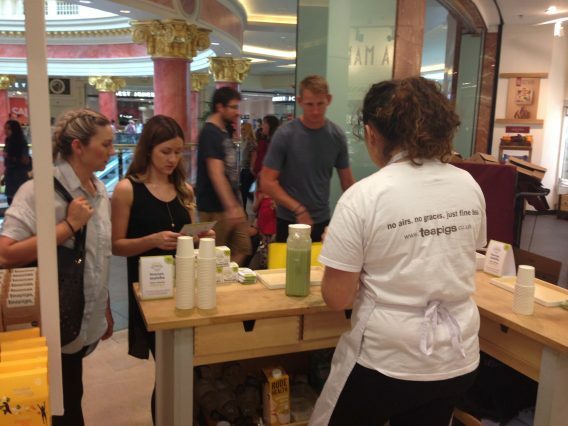 To support their product listing in Selfridges, teapigs arranged a pop-up matcha bar at the Trafford Centre in Manchester. The brand enlisted eventeem’s support to activate the promotion, implementing the concept and manning the bar for the 9 day campaign. The role of the brand ambassadors would include maintaining stock and ingredients, instore sampling, the formulation of matcha cocktails and ultimately driving sales. Having worked with teapigs for a long period of time, eventeem was able to provide an experienced team of promotional staff with strong product knowledge to activate the matcha bar at the Trafford Centre, also providing a team supervisor to take responsibility for the management of the activity including the purchasing of all ingredients for the matcha cocktails and ensuring the campaign ran to brief at all times. The pop up was a great success, thanks for all your help!